Frank Lampard says he is still "finding out about management" but is determined to maintain Derby's promotion push. The Rams drew 0-0 with Nottingham Forest on Monday and for the sixth successive season find themselves in the play-off spots after 22 games. Saturday's visit of Bristol City will be the halfway point in the 40-year-old's first season in management. "I enjoy it. It's taxing, testing and you learn every day. I'm fully into it and I want to be a success," he said. "It is no good to say at fourth we can be content in December, we have to continue and be in contention in mid-May. "We know we are in the race. But any drop in standard, and actually if we don't improve from here, the season might take its toll on us." While Derby have consistently pushed for promotion for a number of years, their aspirations in recent seasons have been curtailed by poor post-Christmas runs. With four matches over 10 days in the festive period and the transfer window opening in January, Lampard said he, the squad and club will face a number of tests - all of which are new to him. "As a player you can never quite gauge what it feels like on this side," the former England, Chelsea, Manchester City and West Ham midfielder said. "It is a challenge for me to use the squad, because we will have to over the busy period, it is a challenge to stay positive and work on the training ground and to get details right and keep going. "And when January comes, if we can do business, and business that improves us - and there won't be loads to do because we are not in the position of other teams in this league - it needs to be spot on. Small improvement may help us in the long run." 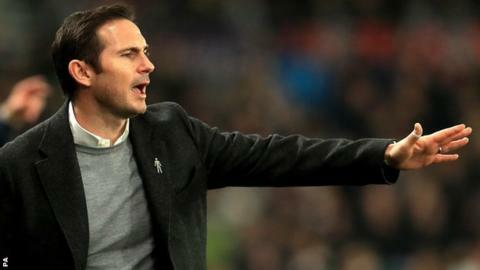 Lampard said taking on one of the oldest squads in the top four divisions in English football, having to sell last season's Championship top scorer Matej Vydra in August and trying to bring in new faces when constrained by profitability and sustainability rules made for a demanding introduction to management. "It's been a big challenge, on reflection," he added. "We are fourth and if you had offered me that at the start of the season and said how close we are to the top, I'd have taken it. "If I look around us, Stoke are behind us, Aston Villa are behind us, Nottingham Forest are behind us - all teams that have invested a lot. "It was a big transition, there was a lot of new players, some younger players, and a lot of work to do. We are not ahead of where we should be, but we should he happy with it."